There are 10 formations in Xeno Quest for players to choose from. 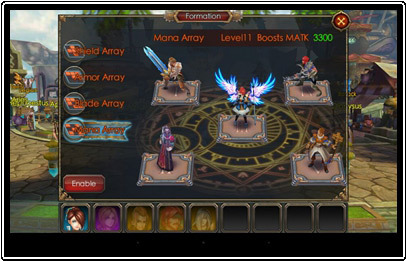 In the early phase, players can only use primary formations like Shield and Armor Array. As levels increase, new formations will unlock. Here is an introduction to the more commonly used formations. Soul Array can boost Defense Skill and is mainly used for PVP fights. Generally, the guard and the character stands in the front row while the back stances are arranged according to the enemy’s formations. The stances are not fixed. Armor Array can boost Physical Defense, and is mainly used to attack the Revered Tower. As the tower monsters’ Physical Attack is quite high, the key to winning is to have high Physical Defense. Players need to arrange stances based on different situations. Some tower monsters are great damage dealers, so you need healers. Some tower monsters can directly kill guards. Then, you need to put a tank before the guard, so the guard can release invincibility next round. Spirit Array boosts Attack Skill. This is mainly used to attack legions and world bosses. Usually, the stances are fixed. To fight the legion bosses and world bosses at night, let the character, Funk, and the damage dealer be in formation. If you have an assistant who does not add Fury, use him as well. The purpose of this arrangement is to reduce the bosses’ rounds to release your techniques. Let the one with the highest attack be in position 1. When attacking the world bosses in the morning, replace the healer with the damage dealer. If you have Riven, put two tanks before him, so Riven is able to release invincibility to gain one extra round of attack. Rage Array boosts Crit, is an outburst array. With multiple bursts and the Rage Array, the assistant of the damage dealer can instantly kill enemies in the back, but this kind of outburst needs luck. To achieve the best effect, please use these four arrays.